Oh dear, sometimes simple ideas are so hard to execute. I’m working on the little book of my memes as suggested a couple of weeks ago, though it turns out that production, postage, and then potential tax complications (to be avoided as I’m only going to cover costs) mean it’s not going to be as easy as I’d hoped, but I am persevering and, if all goes well, hope to have something for you next week! 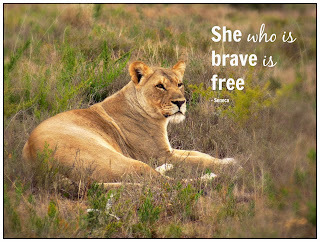 I found inspiration in one of my own notes, though, particularly the quote that said, “She who is brave is free.” I realise that in my personal life, I’ve lost sight of that in the last year or so. After all, we have all been brave when we have had to say good-bye to hopes and dreams, and move on to something else. It’s important for me to remember that I am, and can be brave, and that the rewards are worth it. Finally, I was out today and heard Christmas music (argh! – it’s not even December yet), and so wanted to reassure many of you that one day you’ll look forward to this time of year again, knowing you can celebrate it the way you want to, or not at all, and the sky won’t fall in. There are lots of blogs offering support and advice about the coming holidays, including (here and here) which is specifically for No Kidding men and women, but I also recommend Mel’s annual piece with advice for coping at this time of year that many of us have offered over the years. There’s an unfortunate comment often made to men – it was said to my husband – that they need to “prove you’re a man” by having children. This is my response. A lot of people think that those of us who never had children never lost anything, because we never had anything to lose. My best friend at the time said this to me. and I’ve heard the view elsewhere. But recently, on a silly TV show, the wise comment was made along the lines that losing the past was painful, but losing the future was infinite. It struck me immediately that this is precisely why it is so painful for so many of us. You all know though that I try (try being the operative word here) to choose not to think of the future I lost, but to focus on the future I have. Finally, someone a while ago commented on one of my (brief) posts that they wish they had it laminated, and it got me thinking. I’m thinking about producing a simple and short book, or perhaps a calendar, of some of the memes and sayings that have been well received here on the blog. If I can get it done in the next week or so, it would be available for Christmas or the New Year, if there would be any interest in that. If that is, I can work out the technology and the logistics! This is going to be a little self-indulgent boohoo post. I don't post these often, because I don't need to these days. But even though we have grieved and accepted our No Kidding lives, it doesn't mean we don't miss what we might have had from time to time. I've probably noted before, but there are a couple of children in my family that always make me think. On my side, I have a great-nephew. His mother (my niece, she was my flower girl at my wedding) and I were pregnant (briefly in my case) at the same time. On my husband's side, a niece was born just a few months before my first ectopic. As I was still bleeding and having HCG measurements taken I had to watch my BIL doting on his daughter. This last week, BIL and his family have been in town, and I have had the pleasure of getting to know niece K, now 16, a little better. It's been a joy - especially to discover she is a bright and thoughtful young feminist, something I did not expect given the views of her parents! But it's also been bittersweet, obviously. Last night was Guy Fawkes. My SILs and I were out on the town, as we are hardly ever together at the same time. So my husband went out to his childhood home, and got together for an evening with his three brothers (we can't remember the last time all four of them were together - decades, probably), and with the niece and nephews. DH decided to pick up some fireworks on the way, and apparently they all - young and old - had a great time letting them off last night. I'm glad DH had that bonding time with his brothers, niece and nephews. It sounded like fun. But I'm sad too that he doesn't get to do it every year, with his own children, or even every year or so with nieces and nephews. Finally, on Saturday we had a family function to farewell MIL. Oldest BIL made the only speech, and he did it very well. But twice it was as if DH and I were invisible members of the family, simply because we didn't "grow up and have our own families." Yet we are the ones who have been here, reliably, and very supportively, for the last twenty or so years, for MIL and FIL. But it was as if we didn't exist. The Invisible No Kids. I felt it keenly. But on the bright side, DH said he didn't even notice. I wish I could be more like him! Life has been pretty hectic here, and the last couple of weeks I've neglected both my No Kidding and A Separate Life blogs, even to the extent of missing Microblog Mondays, and so I apologise, and hope there are a few people who will stick around! I did manage a quick post on my daily blog (under two months to go!) that is very relevant here. Last week we made the seven hour drive north to look after my niece for three days, when her parents were attending a conference on her health problems. As delightful as my niece is - and yes, she even admitted we spoil her! - her life is not at all easy. She complained, "I just want to be normal" - a complaint I am sure we can all relate to. Because of her cystic fibrosis, she can never be normal, and that also means that her parents' lives are far from easy as well. I think that this is an important reminder. Not everyone is living the "happy families" dream.